Substitute Martin Boyle's late equaliser rescued a point for Hibernian as they drew 1-1 with Raith at Easter Road. 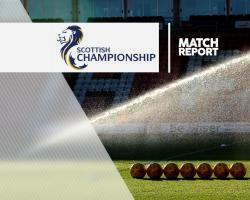 However, it was not enough to keep Hibs at the top of the Scottish Championship as Dundee United's win over St Mirren saw them take over at the summit. Raith goalkeeper Kevin Cuthbert twice denied both Andrew Shinnie and Jason Cummings before Mvoto headed home Chris Johnston's cross after 49 minutes. Rovers nearly extended their lead but Jason Thomson's effort struck a post before Paul Hanlon set up Boyle to equalise.